A little over a week ago, Russia held local elections in 74 of the 83 federal entities. More than 24 million voters were called to the polls to elect about 3.200 positions, for which 50.000 candidates were nominated. This big event served as a “rehearsal” for the December elections, and it was notable that several locations used electronic voting. Russia has been interested in the automated electoral system for several years now, but it was in 2010 when Russia approved the legislation to modernize its electoral system. In that year, the secretary of the Central Electoral Commission (CEC) Nikolai Konkin, visited Brazil to attend the presidential election and assess the applicability of the Brazilian model, which uses keyboard machines that automate the elections 100%. “This electronic voting experience will be taken into account for the modernization of the electoral process in the Russian Federation. The CEC is developing the appropriate program, which is expected to be approved this November”, said Konkin last year when he visited Brazil as an international observer. In the following months, Russia laid the foundations for electronic voting, and in March 13th 2010, several of its provinces experimented with a modern automated system. Bashkiria was one of the provinces that experienced e-voting, using machines with audio guides to guide the voters in simple and fast steps to complete the voting process. The machines deployed worked as follows: once the voter was proven to be eligible to vote and received a card to activate the voting machine, the touch screen presented the nominated candidates. The citizen had to touch on the screen for marking his or her choice, and then pressed the confirmation botton. Then, the machine printed a paper proof of the vote. When the voting process finished, the votes from the ballot were counted, aggregated and transmitted to a computer center. An information Centre provided by the CEC, allowed the Russians to know the results in real time. 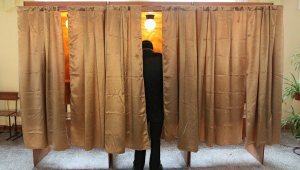 Another technology tested in Russia were the “mobile” or “itinerant” voting machines used in this occasion. These machines were taken to the houses of disabled voters, who couldn’t mobilize to the polling stations due to illnesses or age factors. The displacement was monitored with the Russian navigation satellite system GLONASS. The results of the e-voting implementation in Russia are being fully analyzed. The criticisms of the process that have been made by the political actors haven’t been technological in nature, but political. For this reason, the CEC has declared the process as successful. When e-voting is used, the electoral technology is applied in its maximum expression and capacity. The Election Day becomes the ideal opportunity to adopt the multiple tools available today to automate the elections. The combination of technology, with a major or minor degree of complexity, will define if the elections are partially or totally automated and will also set the margin of how voters will be allowed to experiment with the technology that’s been created to facilitate the vote, but also to strengthen the guarantees of reliable and transparent elections. In principle, the voting day can start for each citizen with one of the fastest growing tools in the world, despite critics: voter’s biometric identification. This technology created to verify the voter’s identity helps eliminate old vices of the manual systems, as in the case of double voting or impersonation. It is based on the use of machines that capture fingerprints, recognizes faces or signatures. The fingerprints, signatures or faces of the voters are compared with records previously taken, and once the machine makes the match of the recorded data, they enable the voter to exercise their right to vote. 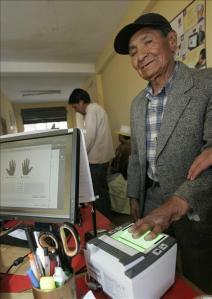 Some countries such as Bolivia have carried out a complete record of their census using 3000 terminals, which collected the three forms of identification listed before. However, other countries such as Venezuela and Colombia have opted for fingerprint identification, using machines to verify the identity of the electorate. Once the voter’s identity has been validated in an Election Day, a complex technology system can be put in place to complete electronically all phases: capturing the vote, vote counting, aggregation and transmission of results. However, today we will focus en the different voting alternatives. There are many variants of e-voting, but most countries have adopted optical scan voting systems or direct-recording electronic (DRE) systems. The first system captures or registers the votes through the identification and reading of electoral ballots, while the second system records the votes electronically in the devices’ memory. In the optical scan voting systems that are used in some American regions and previously in Belgium, traditional paper ballots are used that must be marked by each voter, that are processed by a technological device so that they can be counted. This happens when the voter takes the ballot to a scanner that tabulates the votes in the electoral center. With a DRE system, voters mark their votes directly in voting machines. This system has uses at least two components: a keyboard and a touchscreen. In Brazil, the machines used have a keyboard because each voter has a personal number, and the vote is registered when the voter marks his or her option using the keyboard. With the touchscreen machines, the voter touches his or her choice directly in the screen, which is immediately recorded in the devices’ memory. In more complex elections, electronic cards are used. Venezuela stands out in this type of technology, as the machines provided by Smartmatic allow voting, and only after verifying the ballot, the person presses on the word VOTE followed by his or her choice on the touchscreen. The voter’s choice is stored in the machine and he or she will receive the vote’s printed proof, which must be then introduced personally into an urn. This last resource is currently evaluated by multiple nations, because it retains the speed and simplicity of the act of voting, and it delivers a receipt of the election, which can be used for subsequent audits. 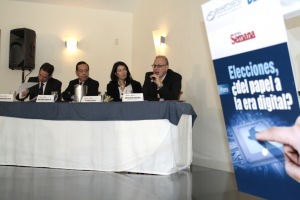 The renowned Colombian magazine Semana, carried out the forum “Elections: from paper to the digital age?” where discussions around manual and electronic voting took place in order to explain why technology is supplanting traditional voting methods for automated voting systems. Representatives of the Carter Center, the National Registry (Colombia) and the National Electoral Council (Colombia), and Smartmatic’s vice president were present in the event. The advances on e-voting around the globe and the success of its implementation were discussed, as well as the obstacles this technology faces. Jennifer McCoy, director of the Carter Center for the Americas, highlighted the benefits of e-voting such as the speed to issue the results, security mechanisms offered by some systems and the ease of use. However, she made clear that the countries that made the change towards automation must build trust with the systems they choose, and the best way of doing so, is to progressively implement the changes. McCoy used the Venezuelan case to illustrate her idea, and explained that in this country mistrust was generated among voters due to the abrupt way automation (an optical scanner provided by the company Indra) was introduced in a politically polarized context (1998). After many frictions, the country finally migrated in 2004 into a 100% automatized system provided by the company Smartmatic. This system has passed all tests and has refuted any hint of suspicion throughout all the years of deployment, up to the point that the main political forces use this system for their internal elections. Eduardo Correia, vice president of the electoral unit of Smartmatic, showed an interesting perspective on e-voting, and said that the cornerstone of this system is the idea of ensuring that the results of any election are determined exclusively according to the will of the voters. He stated that the successful experiences of countries such as Brazil, Philippines and India proven and recorded for over 10 years, support the conclusion that electronic voting is an irreversible trend. Correia compared the technologies of these threes countries, explaining the characteristics of each implemented technology. He showed the Brazilian system, explaining that the machines use biometric authentication, but do not print the proof of vote. He then exposed the Philippine case, and said that according to a survey that was held in that country, the first Asian country that has turned into e-voting, 75% of the voters were “very satisfied” with the conduction, speed and credibility of the election. He also analyzed the Indian case, where the largest automatized election takes place, and applauded the minimum energy consumption required by their voting machines. The forum that took place in Colombia’s capital city, Bogotá, showed the advanced that have been made on the debate around the automation of the country’s electoral system. The National Registrar of Civil Status, Carlos Ariel Sánchez Torres, said that in Colombia there is an enormous gap between the identification and electoral systems. While the country has a very modern biometric identification system that is the result of an investment of 200 million dollars, the Colombian electoral system is old and has many flaws and is prone to fraud. Sanchez stated that efforts for modernizing the electoral system should be done, as had been done with the identification system, but warned that the lack of adequate resources has become a constant that has prevented its implementation. The Colombian Minister of Interior and Justice, German Vargas, affirmed that it would be inconceivable that by 2014 electronic voting would not be a reality in Colombia.